Blueberry 100 by Euphoria Healthcare Pvt. 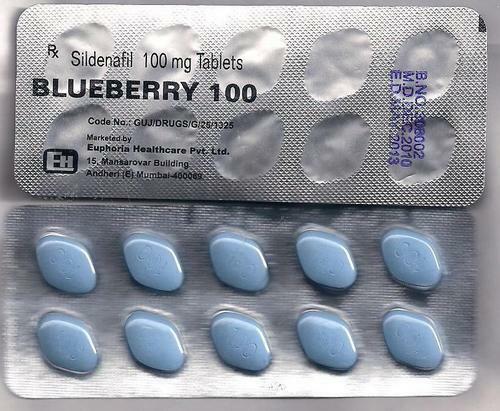 Ltd.
Blueberry 100 is another generic medicine meant for the treatment of Erectile Dysfunction in men and is a product manufactured by Euphoria Healthcare Pvt. Ltd. in India. Even if the product’s name doesn’t suggest so, Blueberry contains Sildenafil Citrate which is an active ingredient of most ED medications in the market. This product’s name sure is catchy and makes one think of food instead of thinking of ED relief. Sildenafil primarily acts to increase blood flow to the penile area to promote erection which ED patients usually fail to have. Sildenafil brands are clinically proven effective, and still remain the most effective way to treat ED. Blueberry and its ED meds counterparts give ED clients a chance to have a normal intimate life. Euphoria Healthcare Pvt. Ltd. is one of the numerous companies which produce generics in India. It is a young company (started 2003) and is a company which specializes in the production of pharmaceutical products plus steroids and others. There is no information regarding the approval of its products by the USFDA or its compliance with WHO-GMP, as well as its ISO certification status. 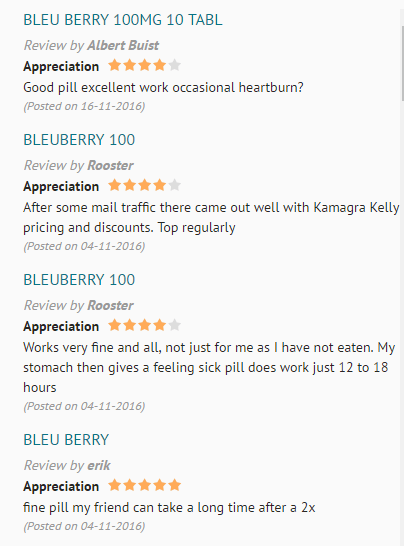 A number of client reviews for Viagra Blueberry 100 are spotted Kamagra-jelly.nl and clients rated the product with 4-5/5 stars due to its effectiveness, although there were some concerns about the drug mentioned by the users. Erik was the one who rated Blueberry 5/5 stars and claimed that the drug had been effective for him. Rooster, another user, rated the product 4/5 as the brand worked effectively for him too, although he confessed that because he wasn’t able to take it with food, he got an upset stomach. He even claimed that Blueberry worked for 12-18 hours. Albert Buist rated Blueberry 4/5 also. He said that the ED drug was indeed effective, but he complained of experiencing heartburn along the way. Blueberry pills are available on the online market in 50 and 100 mg variants. Kamagraline.com sells Blueberry 10 pieces minimum (100 mg) and sells the product at $11.20 per pack. Instructions for Blueberry adapt the ones intended for its counterparts—it is also taken only once a day, but only when needed, and at least about an hour before any planned sexual activity. Internet drugstores have Blueberry stocks available, but it is noticeable that not all of the stores have the product, as it is not as popular as the other generic brand ED meds (Caverta, Suhagra, Kamagra, etc.). Blueberry is also available locally in India, as this product is produced there. Being a Sildenafil product, Blueberry requires a prescription to purchase, although most of the online shops do not actually require prescriptions for their products. Blueberry is taken via the oral route with a glass of water, and it is recommended that users take the product after a meal. Doctors are the one to recommend to patients the most suitable dose to take, depending on their assessment. 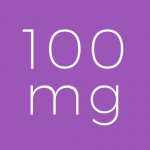 But usually, patients are assigned the 50 mg dose first, and then increased as determined by the patient’s physiological response to the medication. Referring to the user comments for Blueberry, some of the patients were able to experience heartburn and GI upset taking the product. Aside from those, there were no other known effects of Blueberry to users. But since the product has Sildenafil, patients can expect side effects common to Sildenafil products like headaches, dizziness, nausea and vomiting, and similar symptoms. As a general rule, if there’s something unusual, report it to the doctor. Not much information online is available for Blueberry since it is not really a popular medication for ED, unlike its counterparts. But, client reviews were positive towards its effectiveness as an agent for ED alleviation, as it is able to give the same effect as the other Sildenafil-containing medicines, although some of the users reported to experiencing stomach upset and heartburn. With regards to Euphoria Healthcare Pvt. Ltd., which is the producer of Blueberry, there is not much to say. It is still a young company with a number of its own products from various pharmaceutical categories. The information on its site did not give much information on its manufacturing practices and did not also mention certifications which would have made it credible. Since Blueberry is an effective ED medication with good reviews but is from a not-so-credible manufacturer, it deserves a rating of 3 out of 5 maximum. It’s still good to try, though, as Sildenafil brands are really effective, and also considering that Blueberry is a cheaper choice too.